Simplifying your life, amplifies your future. Simplify is my new mantra. For years it seems I have been on the collecting, growing, complicating life wagon. Well, that hasn’t always worked out so well for me. I find myself, like so many, done with all the “stuff” in my life. I realize it makes me feel cluttered, overwhelmed and weighed down. Starting in my closet; I mean, really, do I seriously need all of this? When I read somewhere that the 20/80 rule applied to our closets, I thought what a waste. I decided that would be a good place to start. After about 3 large garbage bags left my closet I felt instantly lighter. I’m not saying it happened naturally or easily, but I pushed through and only kept the things that fit and that I LOVED. Not long after I went on three back to back trips and needed to pack three separate suitcases encompassing a 15 day period. I thought, “No way, that’s impossible after giving away 80% of my wardrobe. But it was possible, in fact I was able to pack in less time than I could have imagined with all the “excess” clothing I had before clearing out. Lesson learned, less is more. I continue to give away my excess in all the rooms of my house. From furniture to pictures hanging on my wall. When my space is simple and cleared my mind is more restful and able to think clearly. In fact, this lifestyle is biblical. No wonder it makes me feel so good and free! And this simplifying doesn’t end there, Feeling overwhelmed and strrreeetchhhed out with my commitments at work, home and volunteering I had to reevaluate the priorities in my life. I gave myself five areas and after they were full I needed to accept the season of life I am in and embrace only them. Do less and be better at the things I do. My faith walk and recovery, My immediate family (husband and son, which includes homeschooling),  my work with our business,  adult children and grandkids, and finally our aging parents. It’s no wonder I was exhausted trying to add to this full load. So, in working on my FOMO (fear of missing out) I have learned to say No to things I love and wish to be involved in so that I can enjoy this season of life I am in and do the job I am called to do well. No surprise, when I did this I was instantly relieved and at peace. 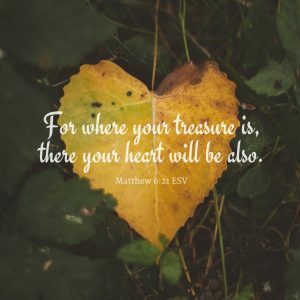 “For where your treasure is, there your heart will be also. Matthew 6:21 I think this is one area the Millenials may just have it figured out. KISS Keep it simple stu… Well, you get the idea. Simplicity is my current focus. By keeping out the unnecessary “things” I have more time, more freedom, more space in my head, much more peace and more quality of life. We’ve heard Quality over Quantity. I am grateful for this new awareness. I never want my things, my collection of memrobelia or sense of obligation to give to distract me from the relationships and from being in the moment that I now have. I encourage everyone to discover the beauty of Less. So, the question I continually ask myself is what do I treasure and is it evident in the way I am living my life?